I have been reading through some of the requests for music that have come in recently, and there is a very clear winner - country music. As of today, Feb. 27, I have tightened up the playlist quite a bit. Listeners do like their classic country, apparently. There was an email from a long-time listener to country music asking if I knew of an artist from the 70s named Connie Eaton. I do, and a couple of her songs have appeared for some time on the playlist. At the same time, naturally, there are emails from listeners who regularly ask for the newer songs. "I'd like to hear Tim McGraw..Carrie Underwood, etc." In the country genre is somewhat of a "today's pop country -vs- grandpa's old country music" that rears its head quite a bit. My personal opinion is that there are songs I both like, and dislike, personally, on both sides. Neither side is right ot wrong. It boils down to personal preferences. In the playlist purge, just over 1200 songs have been taken off the playlist for now. I have just under 700 "active" titles on right now. I plan to fill the playlist back out with classic country music that YOU ask for. So right now is a great time to request that long-forgotten song that your local station won't play because their programming is poed in from Atlanta - or San Antonio - or wherever. Radio's strong point has been the one-on-one relationship that can be made with the audience. Radio is not doing that anymore. I value relationships. I like the interaction. For now, you have spoken, and country it is. You can send me your feedback at alanmccal@hotmail.com. Today, I'd like to take some time to answer some of the questions I am asked most often. This is just a sampling of what comes in every week. Q: How do I submit music for airplay? Alternatively, you may submit an mp3 to me directly at: alanmccal@hotmail.com. It may take me up to three weeks to have the time to review your submission. If a song is really a great fit, chances are I will discover it a little sooner. I do try to respond back to every submission but will admit that sometimes it is just not possible. Q: When a listener requests a song, does it actually get played? A: Almost always, the answer is "yes." I will qualify that by saying that our music library does not contain every song, but I am working to get it as complete as possible in these genres: country/classic country, oldies, and soft AC. Soft AC is probably the most dofficult because it is such a large choice. However, it is also true that we have music seldom heard or played by other stations. Q: How long have you been streaming? A: Originally the station signed on with a contemporary Christian format on July 9, 2001. After about two years, supporters of that format had more choices with K-Love, Way-FM, and some other local stations. I changed the format to classic country on July 27, 2003. With a few tweaks here and there, and later adding more current country to the mix, we stayed primarily country for nine years. 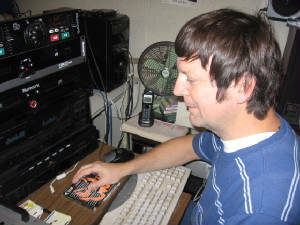 In October 2012, in anticipation of a possible LPFM opportunity, some oldies and soft AC songs were added to the country, for a more full service format targeted to the local community. If you live outside of Tallahassee, the format probably sounds a little different to you. It is a hybrid country/soft AC format with some oldies and some adult standards. I assure you, there is a method to the madness and I have started to see local support begin to pick up a bit. Q: Are those real ads in the stream? A: Yes. Those are real advertisers. We still do not have enough to really be self-supporting, though. Q: Why do you do this if you aren't making a living at it? A: I keep asking myself that same question! I haven't really ever found anything else to do either. because I do not drive, I have to be able to work from home - and after several scams I am through with these "business in a box" ideas. One direct mail business actually did work. I was very sad when they discontinued that particular business after the owner decided to become an online-only service. However, I love to bake. With Florida's Cottage Food Law now in place, it is legal to sell certain foods that are prepared in a home kitchen. The rules are restrictive, but we are planning a total kitchen makeover as right now I have almost no counters. I am probably going to do the food business, AND the radio station. Maybe cookies are an easier sell than advertising! If you have a question, I will be happy to answer it if I can. Also be sure to like our facebook page at http://www.facebook.com/bigdradio. Email me at alanmccal@hotmail.com.